To celebrate the 90th birthday of the most successful race team of all time, Hublot, which has been a long-standing partner of Scuderia Ferrari, is proud to present the Big Bang Scuderia Ferrari 90th Anniversary watch. This is a model that reflects the rich history and heritage of Scuderia Ferrari realized in three limited editions conceived in collaboration with the Ferrari Design Centre. These pieces illustrate the development of the materials used in car racing over the years. 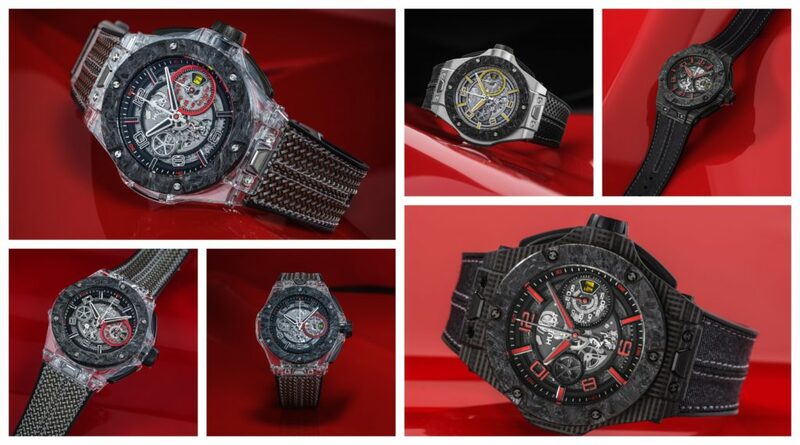 This is a permanent quest of both companies, as illustrated by Hublot’s motto “The Art of Fusion”. No future and no victories without innovation. It is only through technical and technological research that the two houses have been able to maintain their respective positions in their respective worlds. The 45-mm-diameter of each of the three editions houses the famous UNICO movement, a flyback chronograph that offers a 72-hour power reserve. Their bezel is cut in ceramic carbon, the same material that is used for Formula 1 brake discs. sophistication that technology is heading towards and the possibilities it offers for the future. A promise of innovations that will apply to both car manufacture and watchmaking. Its strap adopts a highly futuristic Kevlar look. 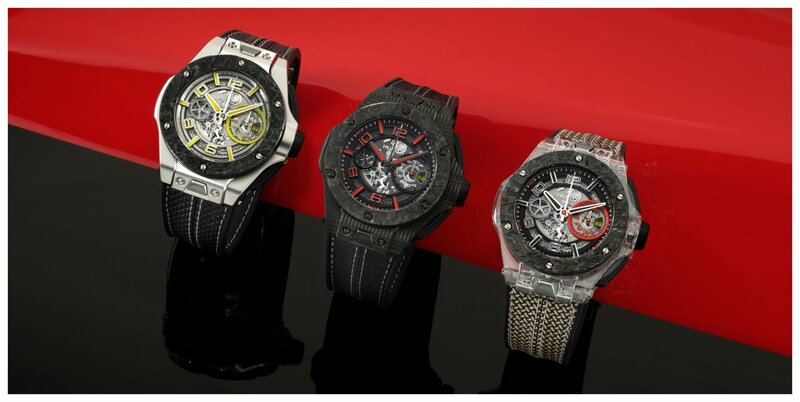 Each of the three versions of the Hublot Big Bang Scuderia Ferrari 90th Anniversary watch bears one of the three colours of the Scuderia on its border, the numbers and the index. Yellow for the platinum edition, red for the 3D carbon edition and black for the sapphire edition. All three will be produced in a limited edition of 90, and 10 ‘collector’ sets with all three watches will also be available. A bit of history. Scuderia Ferrari came into being on 16th November 1929 in the offices of the notary, Della Fontana of Modena, the company established as the Società Anonima Scuderia Ferrari, with its headquarters in via Trento and Trieste. It was approved by the courts on 29th November and from that moment on the company was effectively operational. The directors of the company were Alfredo and Augusto Caniato, Enzo Ferrari and Ferruccio Testi. Alfa Romeo and Pirelli were also involved.